The machine is based on a robot already used by the military to disable bombs. Officials say the robot warrior is fast, accurate and will track and attack the enemy with relatively little risk to the lives of US soldiers. 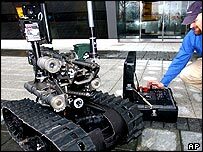 Unlike its human counterparts, the armed robot does not require food, clothing, training, motivation or a pension. When not needed in war, it can be mothballed in a warehouse. However, the robot will rely on its human operator, remotely studying footage from its cameras, for the order to open fire. 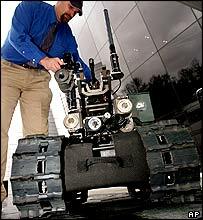 It is based on the Talon robot, which is widely used by the military to disarm bombs. A US officer who helped test the robot said it was a more accurate shot than the average soldier because it is mounted on a stable platform and takes aim electronically.